Welcome to White Dolphin 4 Cabin. Our luxury Cruise is 23, 5 meters in length and 6,4 meters in width, including 4 superior cabins with full amenities in 20 sqm room: individually controlled air – conditioning, life vest, shower, hot water, toilet, bathroom amenities and comfortable Queen Size Bed. 07:30: Pick up from your hotel in Hanoi. Drive to Ha Long City through the green fields in the Red River Delta. 10:00: Stopover on the way for a refreshment break. 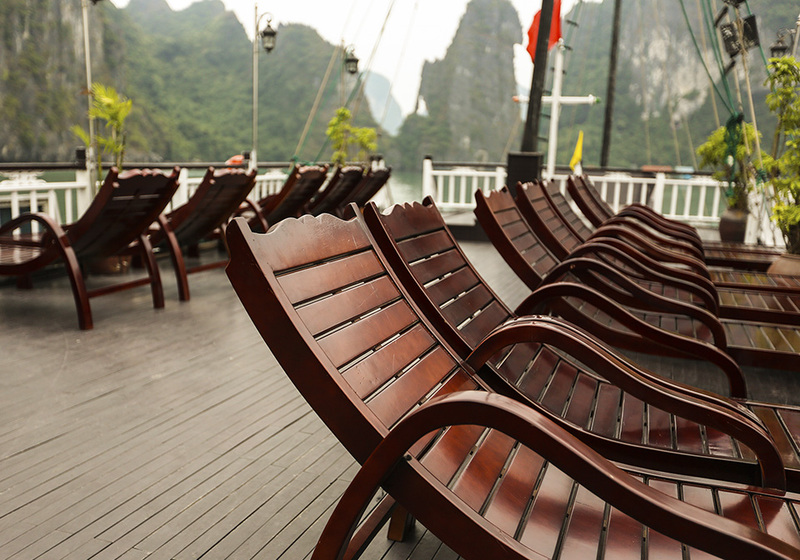 12:30: Boat Cruises on Halong, enjoy a welcoming drink and cruise briefing. 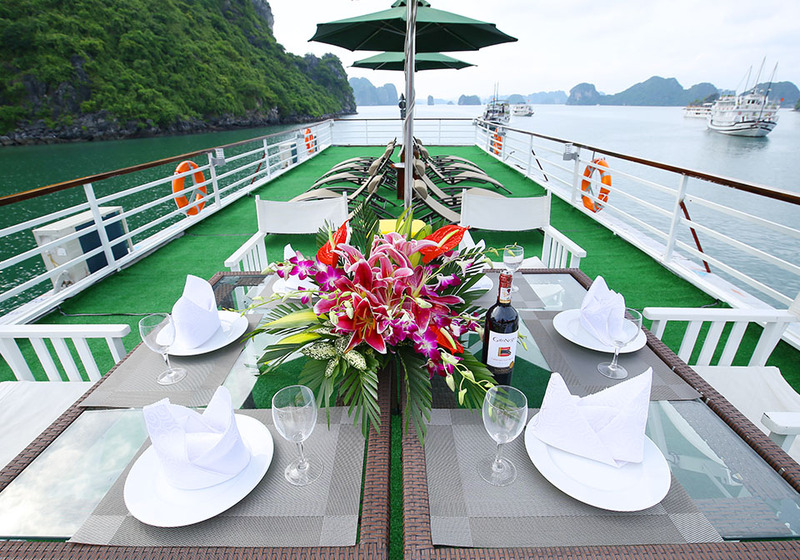 13:30: Have lunch while cruising in Bai Tu Long Bay, admiring the fascinating rock formations in the bay. 15:30: Transfer by tender to Thien Canh Son cave. Our tour guide will take you to a huge cave with many interesting stalactite and stalagmite in different amazing shapes …. After about half an hour visiting, you will go back to tender and return to the boat. Then return to cruise for your leisure or join sunbathing, enjoy swimming in the crystal clear water. Join with cooking class by our chef. 19:00: Vietnamese style set dinner is served on board. 21:00: Take some leisure time to enjoy chatting at the bar or enjoy some night fishing. Stay overnight on boat. 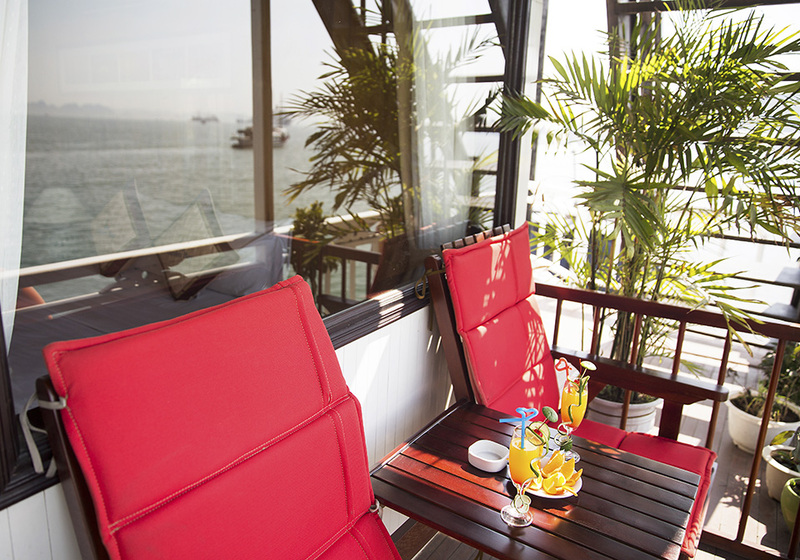 07:30: Have breakfast and enjoy sunrise on the bay. 09:00: Visit ancient Vung Vieng floating village you are not only be immersed in the quiet and peaceful atmosphere, but also be surrounded by the rocky mountains by small bamboo boat for an hour in to the ancient village then return to cruise for relaxing and check out the room. 11:30: Disembark at Ha long wharf, time to say goodbye to the crew. 12:00: Return from Ha Long to Hanoi. 14:00: Stopover on the way for a refreshment break. English speaking tour guide on board. All entrance fees and sightseeing tickets. Welcome Drink (soft drink, tea or coffee). Playing chess, talking. Relax and spend time for taking photos on the beautiful place. 21:00: Take some leisure time to enjoy chatting at the bar or enjoy some night fishing. 09h00: Drop anchor at Vung Ha. Discovering Vung Ha geological park through kayak to see panorama view of Bai Tu Long Bay with thousands of islets around. Here you can stay on private beach for relaxing, take sunbathing and swimming at Vung Ha Beach. 13h30: you will come to discover Be Ong Dau area by kayak. You will explore a huge lake surrounded by mountains. Take sunbathing and swimming at Be Ong Dau Beach. 15h00: Kayaking back to the boat and start cruising back to the main boat then cruising to Cong Do for stay overnight. 21h00: Take some leisure time to enjoy chatting at the bar or enjoy some night fishing. Relax and spend a romantic night on Cruises. 08:00: Visit ancient Vung Vieng floating village you are not only be immersed in the quiet and peaceful atmosphere, but also be surrounded by the rocky mountains by small bamboo boat for an hour in to the ancient village, then return to cruise for relaxing. 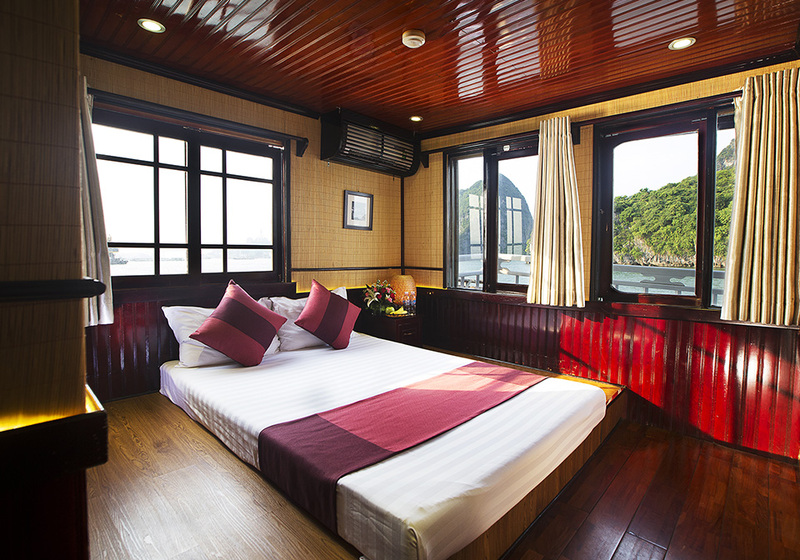 10:00: After an hour around floating village, you back to the boat and packing your luggage and check out the room. 16:00: Arrive in Hanoi. End of the trip. Hand crafted wooden furniture including working desks, wardrobes, and luggage shelves. High quality wooden beds, comfortable mattress, soft pillows, crisp bed linen, and nice warm blankets. Daily changes of bed sheets, blankets, pillows, bath and face towels. Specializing in Seafood, International and Vietnamese cuisines, our extraordinary dishes take on a blend of Traditional and Fusion flavors. Our succulent meals are only made with the freshest ingredients and produce available. Our very hygienic kitchen and preparation areas are located on the same level as the restaurant and cleanliness is our priority. We can easily provide for any type of dietary requirements including vegetarian, children’s meals, non-seafood eaters or any allergies caused by food.